Kobe Bryant forever idolized Michael Jordan growing up, taking endless notes on his scoring, his competitive drive and leadership style. So when Bryant first matched up against Jordan on Dec. 17, 1997, the Lakers’ star wanted to make the most out of it. Bryant did not act intimidated, knowing that demeanor neither matches his personality nor Jordan’s. Though the two bantered back and forth, Bryant did not just resort to trash talking. Instead, Bryant asked Jordan during a stoppage of play how to find more space to shoot. Bryant called the feedback “very inspiring for me,” for reasons that included Jordan’s openness and, well, the source. Safe to say Bryant applied Jordan’s feedback pretty well. Bryant won five NBA championships. He posted a career-high 81 points in a game nearly eight years ago. Just this past season, Bryant eclipsed Jordan for third place on the NBA’s all-time scoring list. And yet, Jordan still has bragging rights over Bryant, the Lakers’ star still one title short of matching Jordan’s ring count. The NBA TV interview showed footage of Jordan making that very point to Bryant during Jordan’s last season in the 2002-03 campaign when Bryant’s three championship trophies represented only half of Jordan’s hardware. With Bryant revealing his career-wide NBA goal has entailed just to “win as many championships as possible,” the Lakers’ star often invokes his ring count when trash talking against other opponents. But he could not use that tactic against Jordan. Instead, Bryant would try to find an edge through other means, namely outworking both his inferior and equal competition. That meant Bryant would find different ways to score. He would also find different ways both to recover and nurse his different injuries. 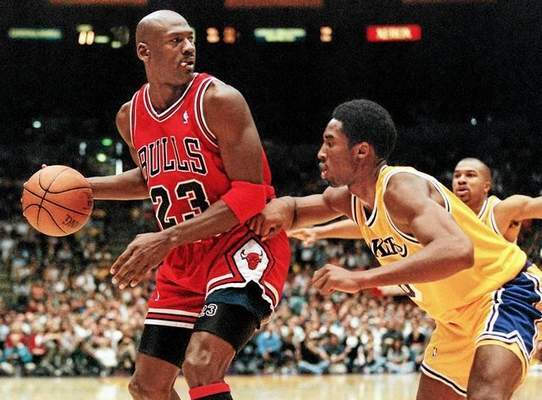 That marks a mentality Bryant adopted partly because of Jordan, who often said publicly he was aware of always wanting to put on a good performance for the fan who would see him play in person for the first time. Hence, Bryant’s questions to Jordan just as they would square off.